In a copywriter resume, it’s critical that you are able to convey your writing and marketing expertise in your professional summary. Expand on skills in your work history, using details about each role that call attention to your accomplishments. As a writer, take care you’re your resume is free of spelling errors and other typos. Hiring managers hold copywriters to a different standard than applicants in other industries. Read your resume aloud. Ask a friend with a similar background to look through it as well. 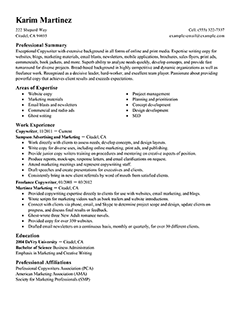 For more ideas on how to polish your resume, look at our copywriter resume example. 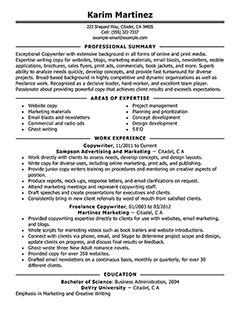 Our collection of resume examples makes it easy to create your own copywriter resume. And remember, a well-written resume can spell the difference between a quick job offer and a long job hunt. 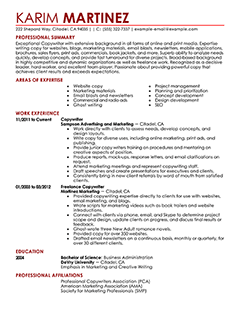 Check out our resume samples below, which include everything from writing advertising copy to drafting marketing messages. You increase your chances of finding jobs as a copywriter when you take the right steps. These tips can help you plan a winning strategy for a successful job search. 1. Work your network. Talk to as many people as you know. It’s likely someone has contacts, leads or other information regarding employment opportunities that fit your career goals. 2. Update your resume. Make sure the content is relevant to your career field. Also, if there are any new changes that you have experienced, such as a getting a promotion, earning certification, acquiring a new skill or winning an award, add it to your resume. 3. Broaden your job search. Utilize every employment platform that gives you an opportunity to circulate your resume, make contacts and meet prospective employers. For example, attend job fairs and utilize job banks. 4. Research potential employers. The more you know about the company, the better you can target your job search efforts. It also gives you the information you need to determine whether the prospective employer is a good fit for you. 5. Take an assessment. This is especially important if you’re new to the job market. These tests help you pinpoint your strongest interests, values and skills. By doing this, you can refine your career goals and target the jobs that best match your personality, background and experience. A resume is the most important weapon in your arsenal when it comes to your job hunt. A highly polished resume can get your foot in the door. 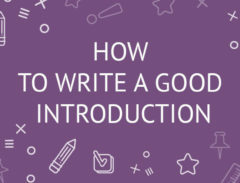 Whether you’re seeking an entry-level position or you’re a well-seasoned professional, these tips can help you prepare a resume that can land you a job as a copywriter. 1. Avoid misspelling and typos. This is one of the most common mistakes that turn off hiring managers. Make you sure you perform a spellcheck and proofread the resume multiple times before sending it off. 2. There are a few must-haves for every resume. They include your name, address, phone numbers, email address, education and experience. 3. Ditch the objective statement. Prospective employers don’t read them. They are considered irrelevant in today’s job market. 4. Include a branding statement. This is like a 30-second sales pitch that you place near the top of your resume. 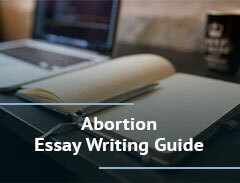 In a few sentences, it summarizes and showcases your unique qualities, accomplishments and skills. It makes the case for why you’re the best person for the job. 5. Use industry-specific keywords. Nowadays, many employers scan resumes using keyword searchable database software. This is the first step in the review process. If the right keywords aren’t included, your resume will not make it to the next stage. So, make sure you use terminology that’s relevant to your career field.